Landmark Aviation - 5500 44th St. SE Bldg. 403, Grand Rapids MI. If you're looking to put floats on your Caravan or if you're looking to buy an Amphibious Caravan, this is your company. 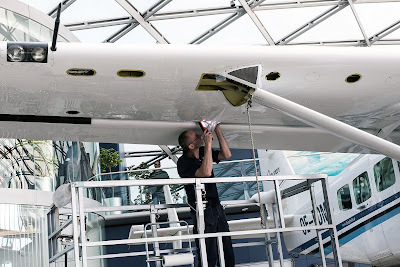 Wipaire also offers maintenance, avionics installation and repair, interior installation and design and painting. In business since 1982, Preferred Airparts buys and sells ALL Cessna Single, Twin, Caravan and Citation parts. Yingling Aviation has been around since 1946 and is the largest supplier of parts for Cessna. Banyan was founded in 1979 and provides a variety of services for Caravan owners and operators, including airframe and engine maintenance, avionics, parts, aircraft sales, management and FBO services.